Well, “Hello!” I almost didn’t see you. But now that I do, I see you have a weed with a perfect view of all around you, and a perfect leafy green safe space in which to retreat. What do you see little insect, as you gaze out upon my garden? Is there something special you are looking for? It wasn’t until my lens captured your image that I became aware of your complexity. I am sorry to say that I overlooked you and dismissed you until I got a closer look. If I’d been working in my garden, digging or hoeing or planting, and if you’d buzzed my ear, I am quite sure I would have swatted you away. But now, I give you fair due and I study you, wondering what you are up to. Are you wondering the same about me? I see an antennae and legs and a segmented body, but I am not sure of all what else that makes you – you. Perhaps I should not be so quick to dismiss. 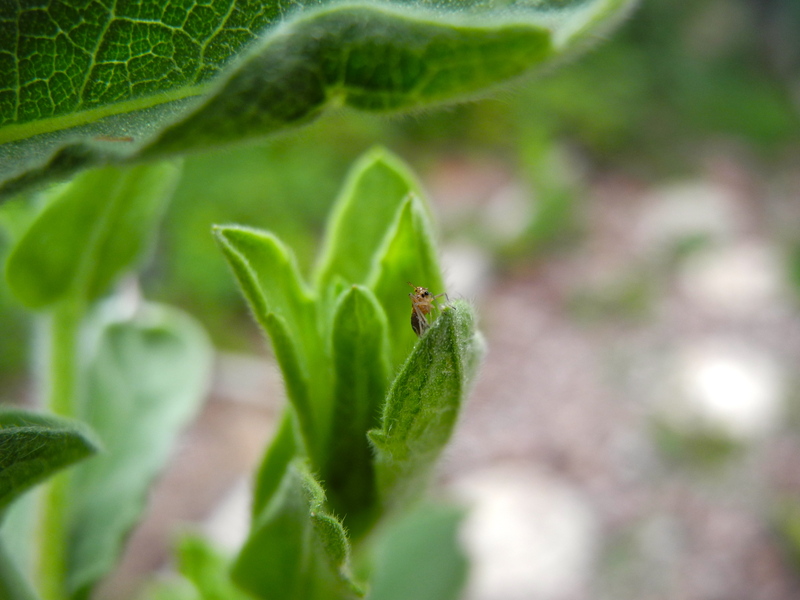 So, little insect, please accept my thanks for hanging around and not escaping into the dark coolness of the inner leaves of your weedy perch. Thank you for sharing our little moment.